Deal Book. 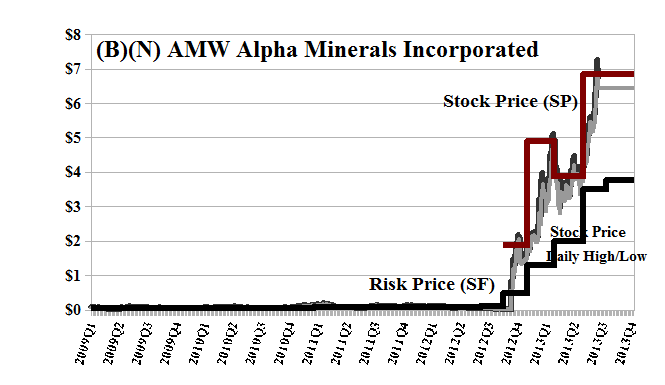 The folks at Alpha Minerals must be “real happy” today because their stock which has traded for around 50¢ or less for most of its life, jumped to $2 late last year, then $4 in April, and closed today at $7.25. Please see Exhibit 1 below. Finding more uranium is, of course, an unfortunate by-product of looking for it (Marketwired, August 22, 2013, Alpha Minerals JV Hits 47m Mineralization Including 5.27m Total Composite “Off-Scale” to Expand R390e Zone at Patterson Lake South, Athabasca Basin). Moreover, its friend to-date, Fission Uranium Corporation, which already has a 50% interest in the discovery, now wants it all and is willing to pay $170 million for what it doesn’t own (Reuters, August 26, 2013, Canadian miner Fission Uranium says to go hostile with Alpha Minerals). However, based on their recent balance sheet (SEDAR, March 2013), there’s only $1 of cash there, there. But the stock price of Fission Uranium is also up from $0.60 in June to today’s $1.42 now, now. Alpha Minerals Incorporated is a mineral exploration & development company with properties in Saskatchewan’s Athabasca Basin (including Patterson Lake South), British Columbia and Ontario.